The current state of fashion was described by some as overabundant, redundant, and obsolete in a way. These words weigh heavy on the designers and challenge them to come up with a plan to resuscitate the curiosity and excitement of the fashion crowd. Some have focused on the story, some on the heritage, some on innovation, some on product. A similar mood and a desire to refresh the “current state of fashion affairs” was felt during this year’s UAD Gala, an event celebrating its 21st edition. From the unconventional venue where the event was held, to the soundtrack of each collection, every little detail was smartly orchestrated and managed to infuse a sense of optimism and ease. 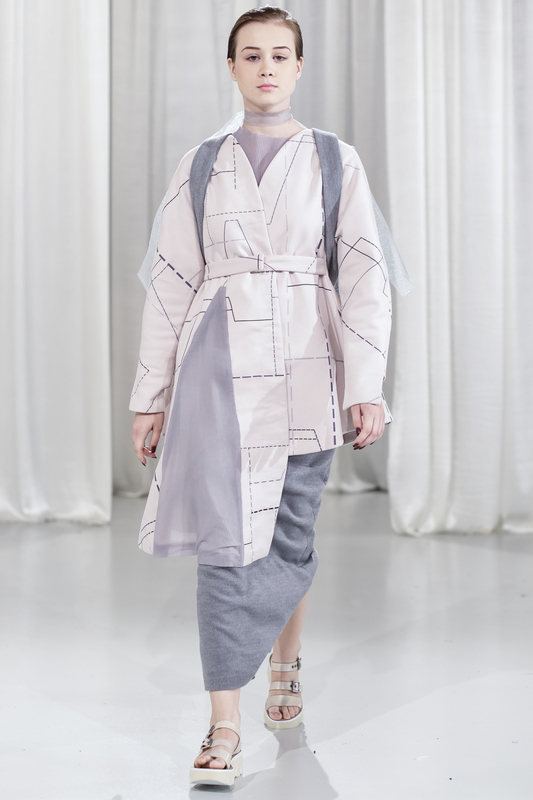 26 collections belonging to this year’s graduate students of the Fashion Design department walked down the catwalk, a catwalk specially designed for the event on the halls of the modern Sala Polivalenta in Cluj-Napoca. The BA collections were coordinated by Prof.Univ.Phd. Elena Basso Stănescu and Lect.Univ.Phd. Lucian Broscățean, while the MA collections were coordinated by Prof.Univ.Phd. Elena Basso Stănescu and Prof.Univ.Phd. Anca Pia Rusan. As in every year since I’ve been attending the UAD Gala as fashion aficionado, supporter of the event, or as member of the Henkel jury (from which I had the pleasure of taking part this year), my first reaction after watching the collections was one of admiration towards the talent of the graduate designers, but also towards the collective involvement of those who guide, and support their talent. What follows next is a period of a few days in which I revisit my first impressions of each collection. I look at the photos, I read my notes, I try to make up stories that can narrate what some of the collections managed to convey. But this year, thinking about what I told you at the beginning of the article, I felt the need to try a new approach and think of the “ingredients” that made this year’s UAD Gala an invigorating event. 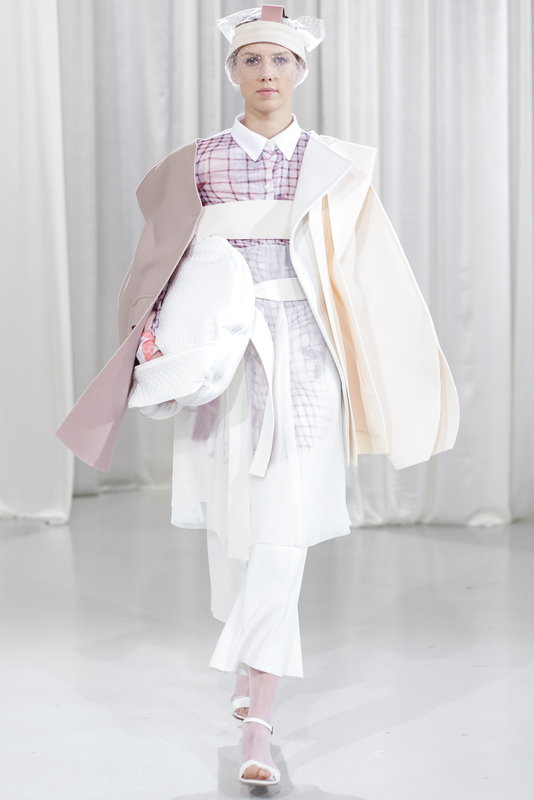 Mixing with ease the minimalism of colour combinations and experimentation with shapes, Aliz Simon managed to portray a personal view of a new age, as the title of the collection announces. 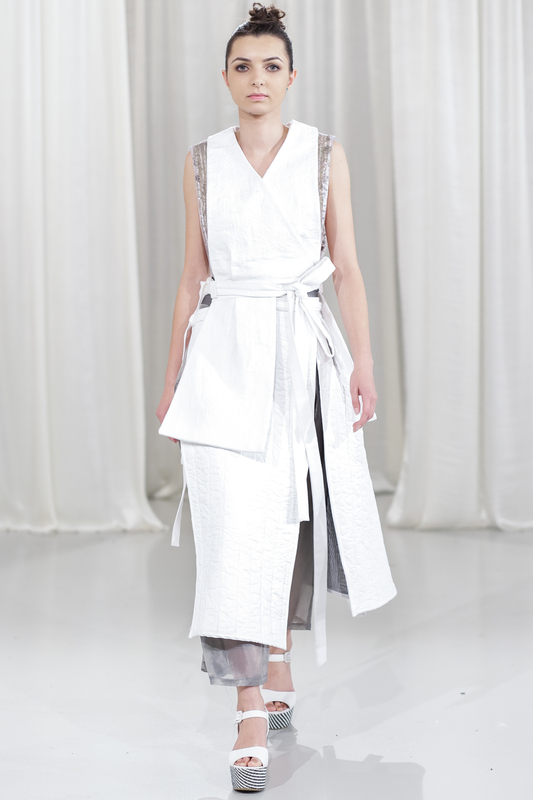 The association of hard and soft materials reveals a modern type of femininity. The woman she envisions belongs to present times, is not afraid to experiment, and manages to maintain her innocence through a sophisticated play on details. Her optimism and wits when it comes to the reinterpretation of symbols and sophistication convinced me and the other members of the Henkel jury to reward her with the Perwoll Young Designers Award. 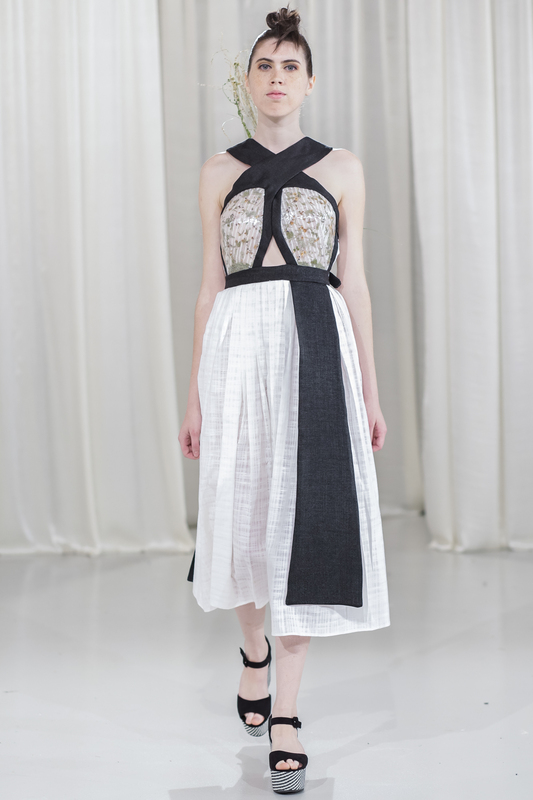 Blurring the lines between art and fashion, Diana Ilea plays with the concept of abstraction. 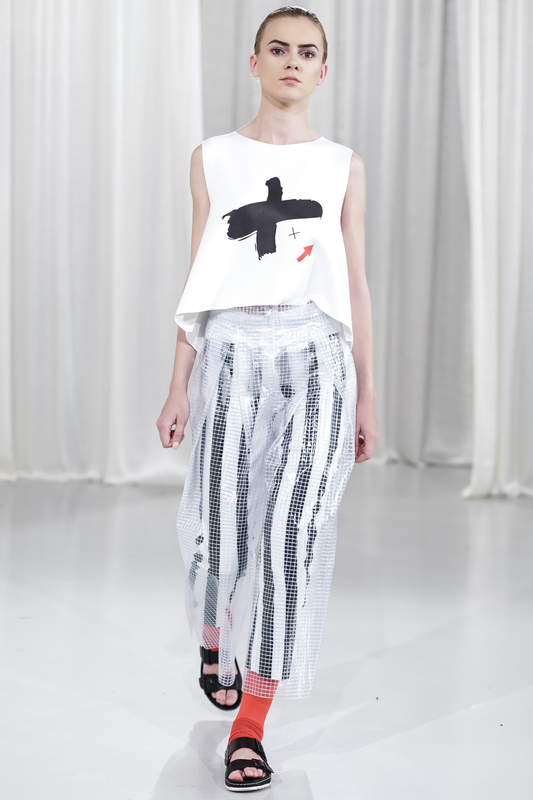 Inspired by modern art, her collection reflects the search for meaning through simplicity. 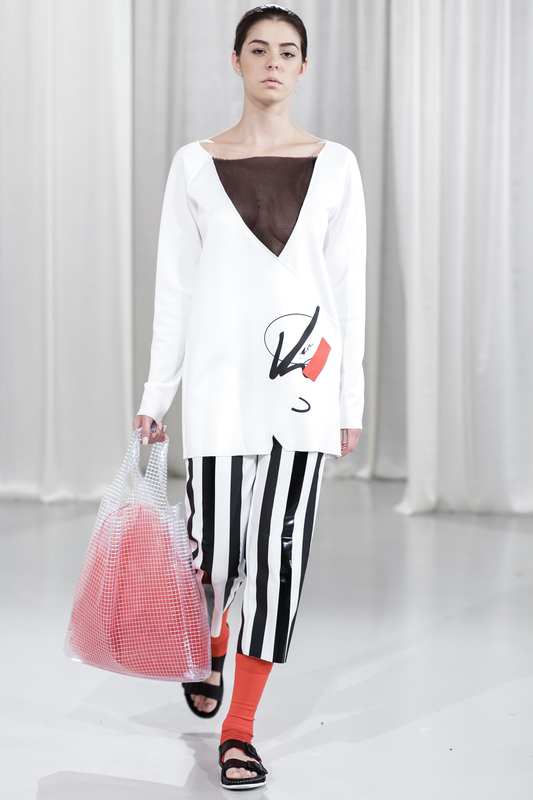 The minimalist lines of the garments are destabilized by violent strokes of red and abstract insertions of ‘untitled” doodles. The association of materialities infuse energy into the designs. 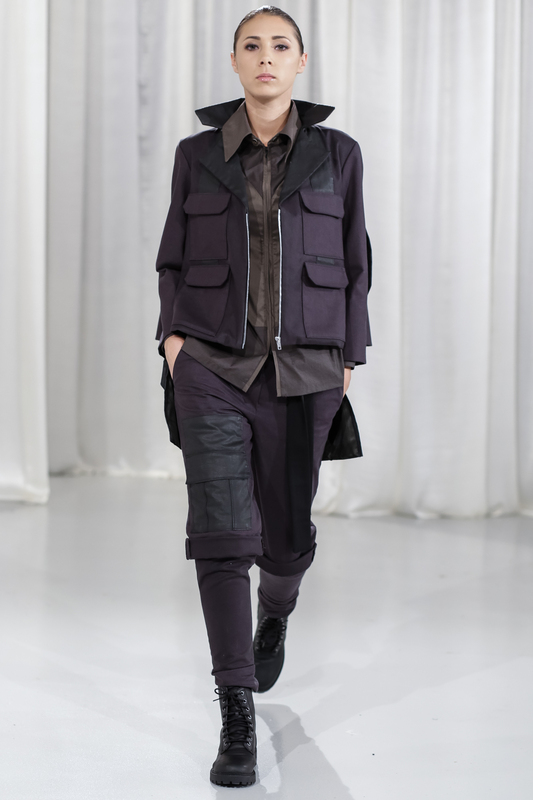 Referencing the feminine lines characteristic of Dior’s “new look” and combining them with the hardness of elements belonging to military apparel, Linda Szabo’s collection reveals her interest in the historical investigation of fashion. 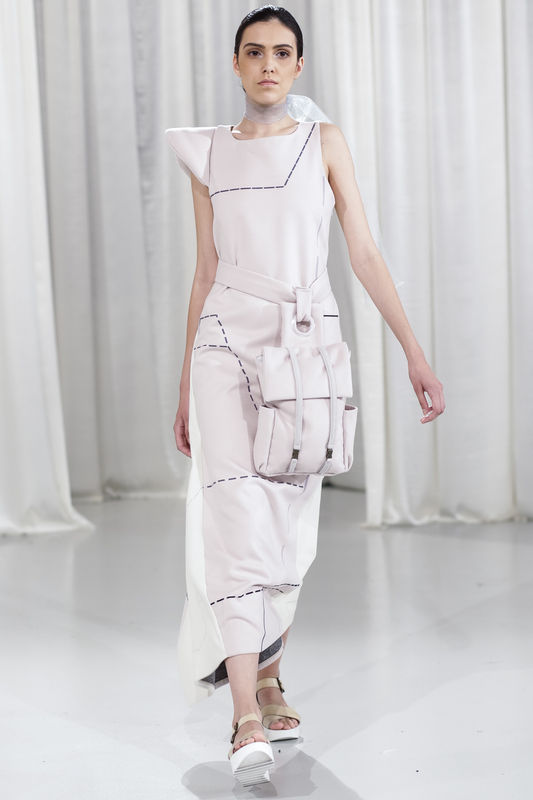 The softness of the colour pallet is contrasted by the toughness of the harnesses, the asymmetric tailoring, and the wadding volumetries. A certain metaphorical struggle can be sensed in Linda’s investigation of the parallels between war and peace, austerity and aesthetical indulgence. The story of a collection is composed of separate points of reference and it takes a skilled narrative tailor to sew them together. Bianca Negrea found inspiration in a zoomorphic folkloric ritual which takes place in winter in some parts of Romania, and is known as “Fools Day”. This ritual implies dressing up in a bear suit, people covered in mud and lard, so it seems kind of crazy of Bianca to choose such an inspiration for her collection. 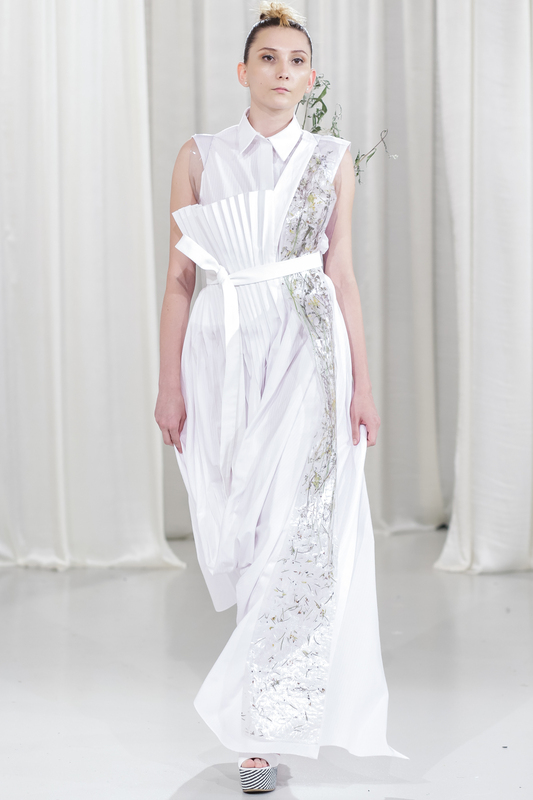 But this is where her collection stands out, due to the designer’s ability to reinterpret a story and infuse it with new meanings. 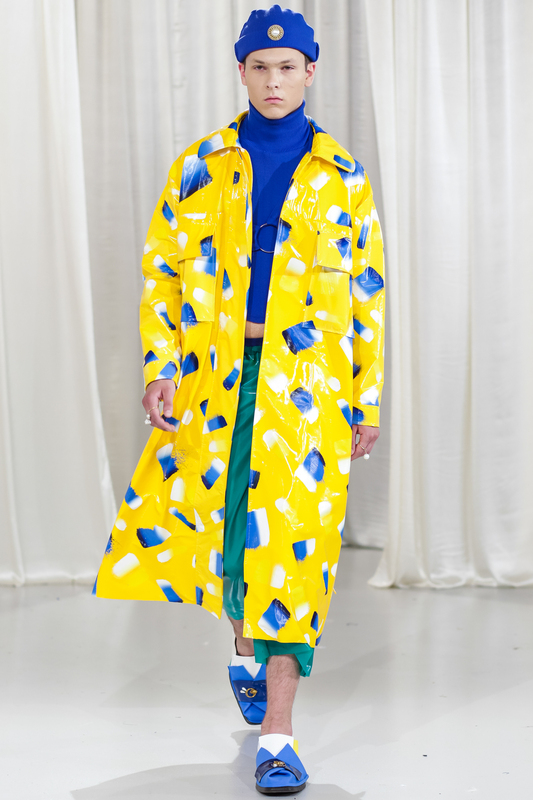 By extracting only the relevant aspects of this story and filtering them through her own esthetic perspective, Bianca Negrea managed to present us a very cool, urban and extravagant collection…which is a long way from lard and mud. Besides their aesthetic function, the purpose of clothes is to protect the wearer from the aggressions of his surrounding environment, be it climatic, social, or human aggressions. Regian Frolich’s collection, entitled “Rising Weapon” seems to tackle a sensitive aspect of our present: the impending threat of war generated by the ongoing conflicts from different parts of the world. 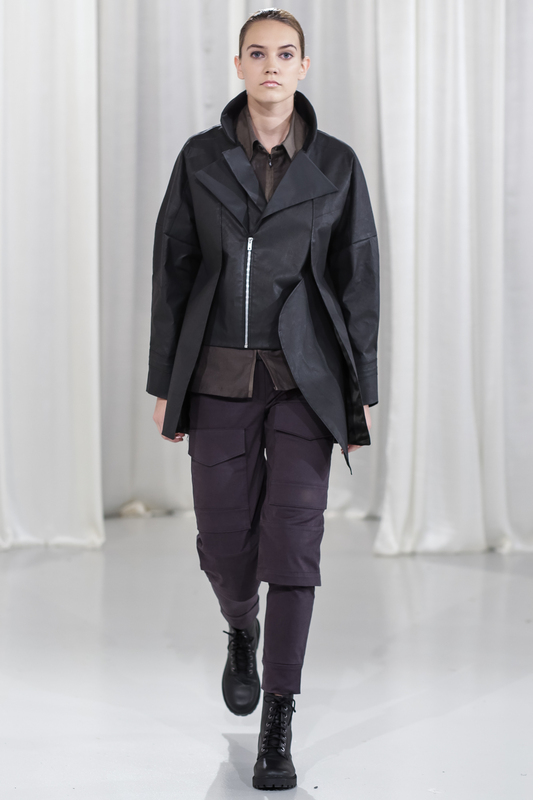 Inspired by military attire, his clothes are designed to shelter our physical body from the destructive social nature. 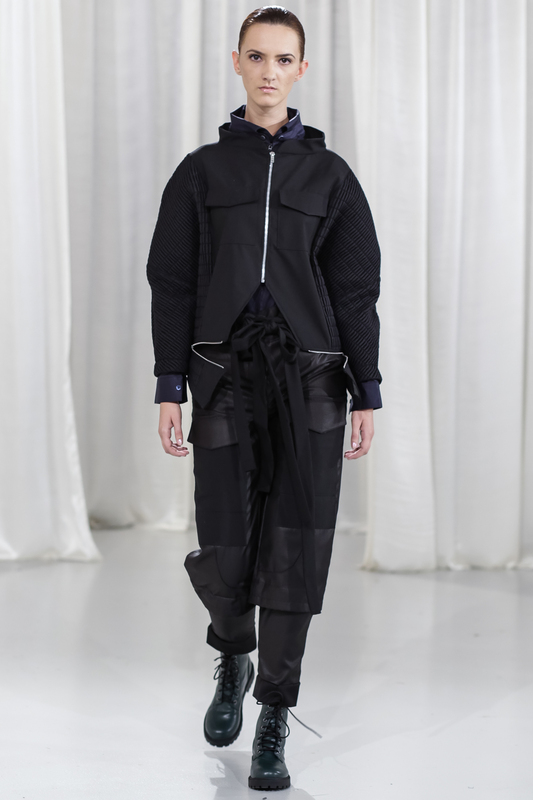 The pieces composing the collection are layered through styling in order to resemble a textile shield which renders the feeling of safety, without ignoring the functional aspect of such attire. When it comes to deconstructing Romanian folklore, many would roll their eyes and tell you that nothing new can be said or done about the subject. Nadejda Iacubina begs to differ, and I salute her for that, because I think that in order to consume ones curiosity regarding a certain subject, one should revisit it, deconstruct and reconstruct it until you assimilate what you were meant to learn and discover. It is a kind of ritual of self-discovery, and the idea of ritual stands at the core of Iacubina’s collection. From a spiritual perspective, the ritual of marriage represents a union between two individuals, who become one. 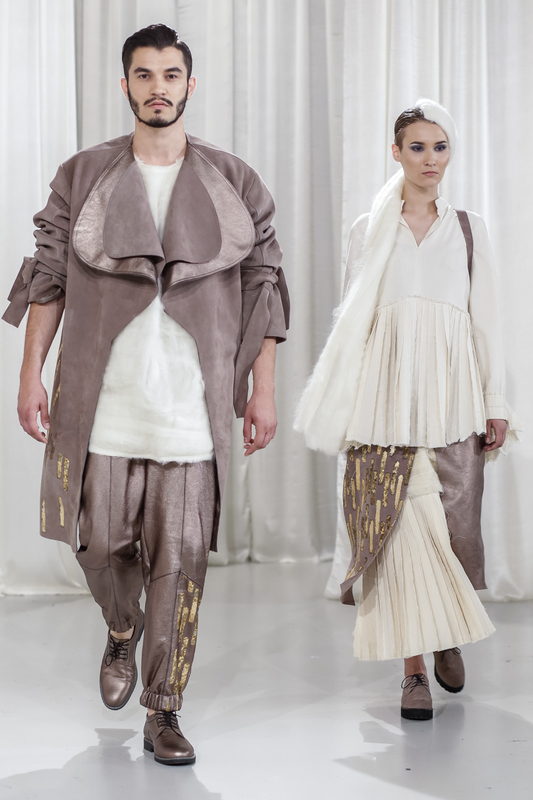 Focusing on the reinterpretation of traditional male attire, the designs symbolise a renunciation of all preconceived ideas regarding gender differences and reveal a visual union of the couple. 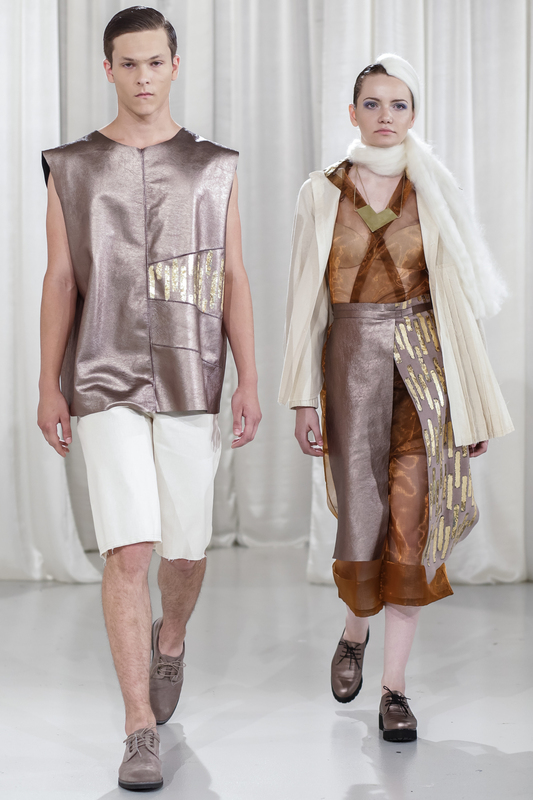 The clothes were made out of raw cotton, leather, and wool with graphic insertions of gold, harmoniously combined. The accessories were inspired by dowry chests, revealing the designer’s attention to details. The fragile nature of creation offers it a unique beauty. 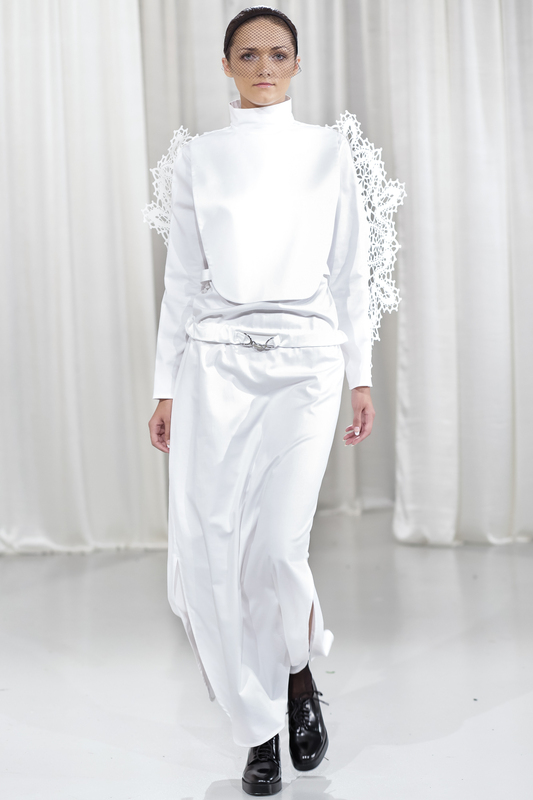 Magdalena Butnariu’s collection investigates this kind of beauty attributing it to nature, celebrating its ability to detach itself and those that embrace it from a mechanized existence. 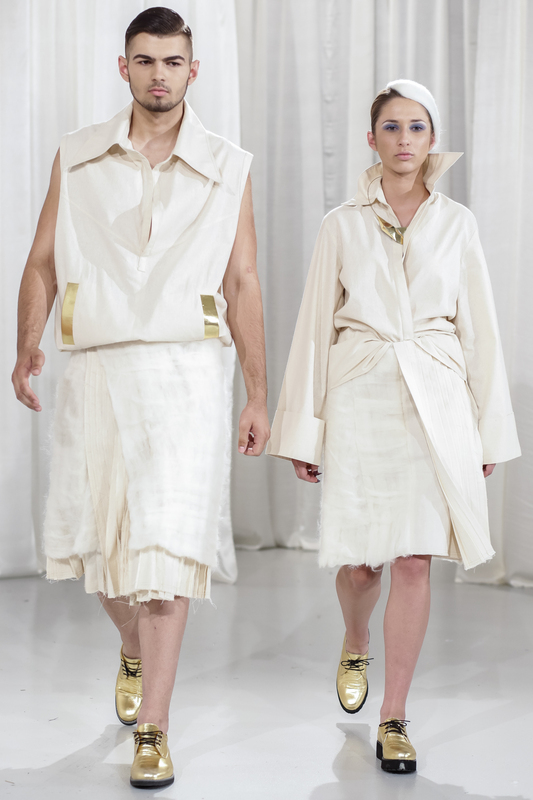 As the models came down the runway in their perfectly starched ensembles, I couldn’t help imagining them as members of a cult, a secret society living in a dystopic reality which has lost its contact with nature, carrying on their backs the remains of a lost world. Eager to save the last traces of humanity, they carry in their wooden and glass backpacks the last specimens of plants, hoping they will find a way to save them. They also hide between the perfectly cut and pleated folds of their garments, as in a herbarium, their favourite flowers which still bare the smell of grass, and trees, and rain. The detached beauty of the garments bore a kind of nostalgia which invites you to meditate on the importance of nature and memory. 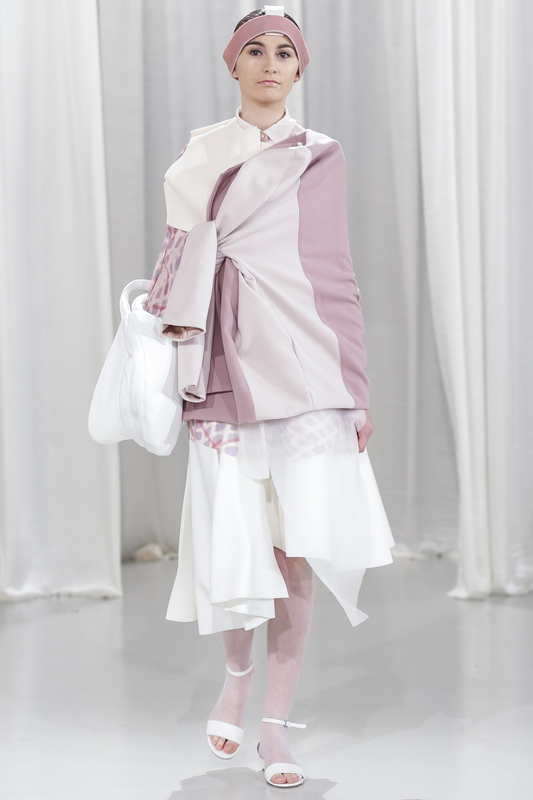 Through her story, designs, accessories and the mood her collection generated, she managed to impress the Henkel jury and was rewarded with the Perwoll Young Designers Award for best MA collection. One of the reasons I enjoyed this year’s UAD Gala was the fact that I got to see some of the BA graduates from two years ago, who were now presenting their MA collections. 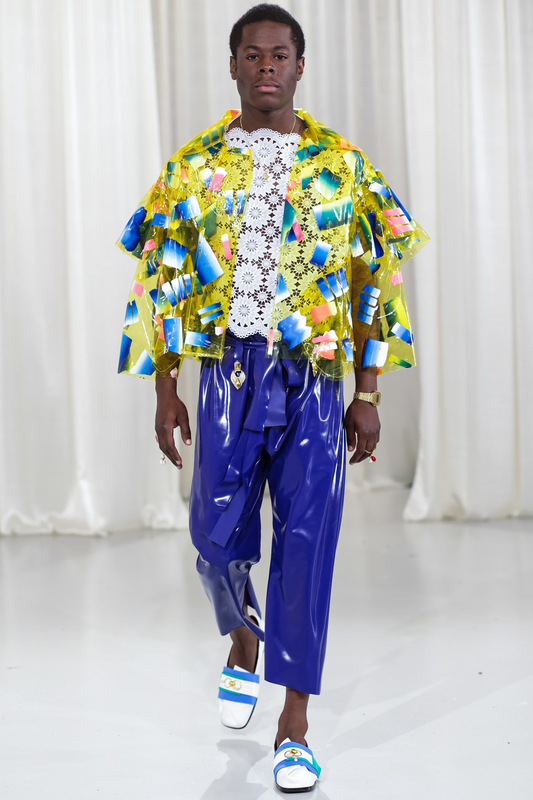 One of those designers is Ancuta Sarca whose funky “Ghetto Superstar” collection from two years ago made me think of running away to join the La S.A.P.E sartorial gang in Congo. 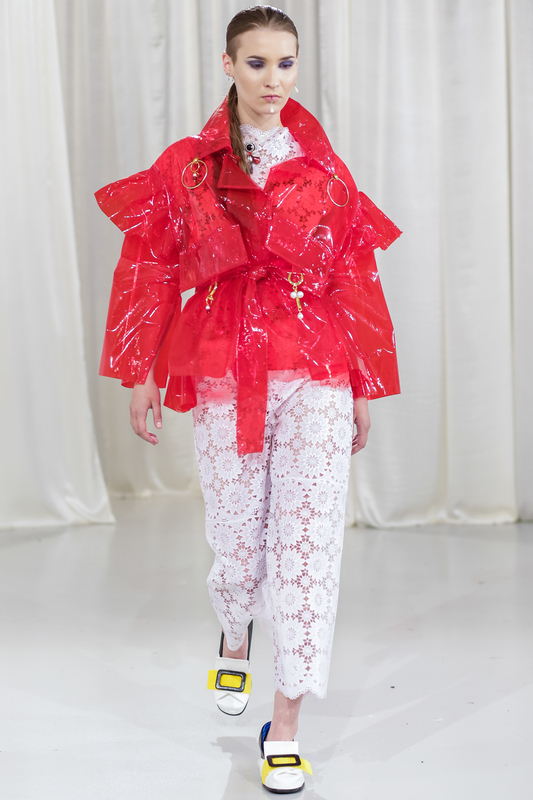 During these two years Ancuta had the chance, through a scholarship offered by the University, to work as an intern in the Meadham Kirchhoff design studio in London. This experience did not change her aesthetic approach, but enriched it with a pathological desire to experiment. Her BA collection entitled “Eleganza” is an eclectic composition mixing 18th century opulence with 20th century subcultures. For me it had a New Romanticism feel which certainly had to do with the uninhabited joy and decadence of mixing colors and textures. 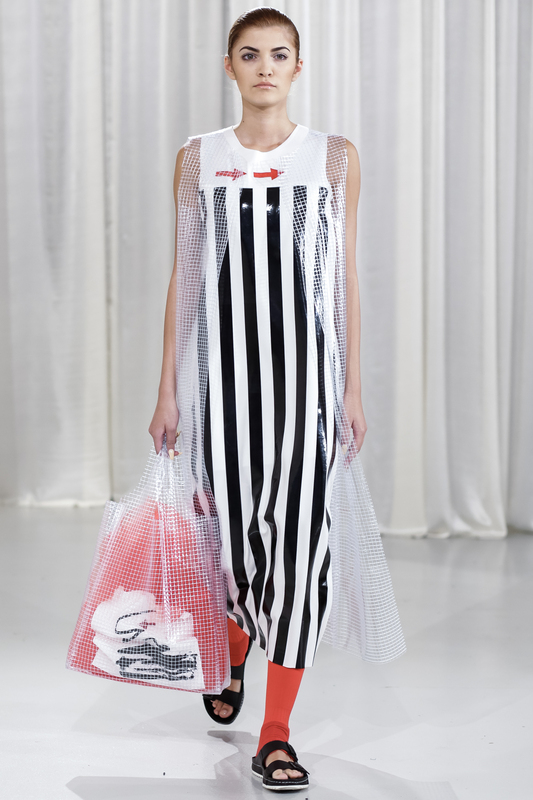 Ancuta Sarca had fun designing her collection, from her rollercoaster ride through history and aesthetics, until the styling details like the shoes which were hand-made by her, or the abstract print strokes that covered some of the garments which were painted by Andreea Tivadar. 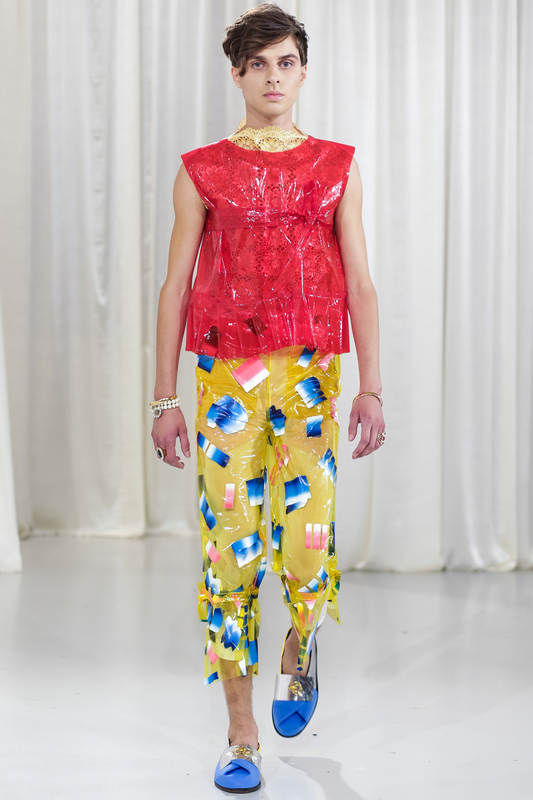 ”Eleganza” can easily function as fashion manifesto for a youth subculture whose members enjoy contemplating the thought of drinking tea and eating cake with Marie Antoinette in a Candy Crush castle. 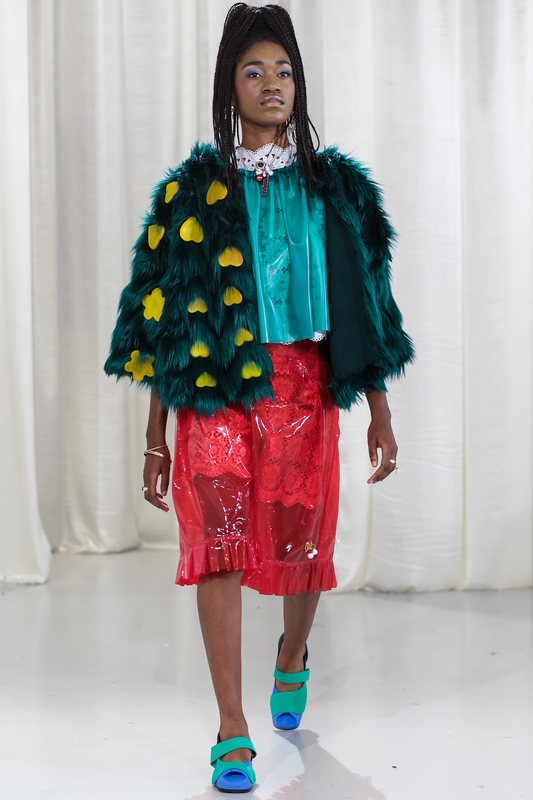 Alina Morar chooses to explore the manele subculture focusing on the fashion choices of those embracing it in order to raise questions regarding prejudices, differences, and the aesthetical value of kitsch. The distinct features of the manele fashion style are opulence, an attraction for oriental embellishments, logo display, western affordable luxury clothing brands, and flashy jewellery. Alina uses all these elements of a distinct fashion style and reinterprets them in such a way that it tricks us into liking a style which we despised for its lack of consistency, refinement and good taste. But how does she manage to do that? 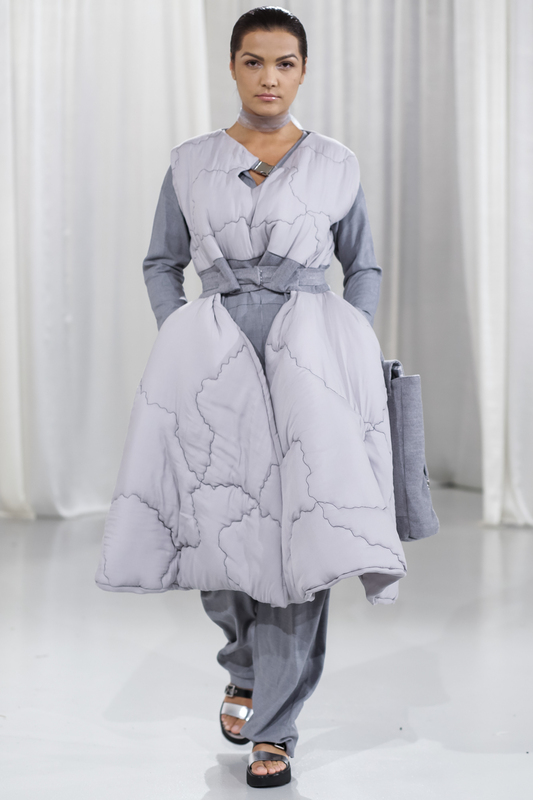 She uses elements from the manelist wardrobe such as suits, flashy jewellery, robes and sportswear and reinterprets them through different tailoring techniques to give them a modern and unconventional edge. Her irony is subtle and witty. 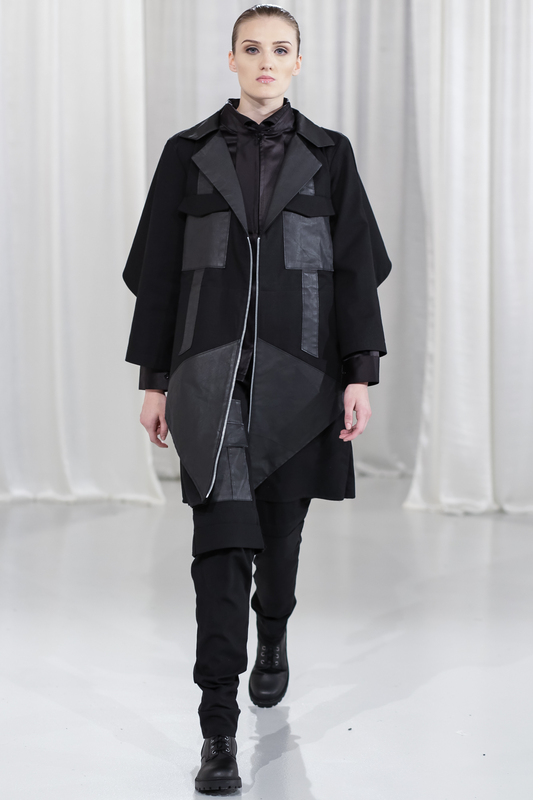 Having as sources of inspiration myth, ritual, ceremony, transition, Andreea Castrase’s collection distinguished itself through a certain detachment. 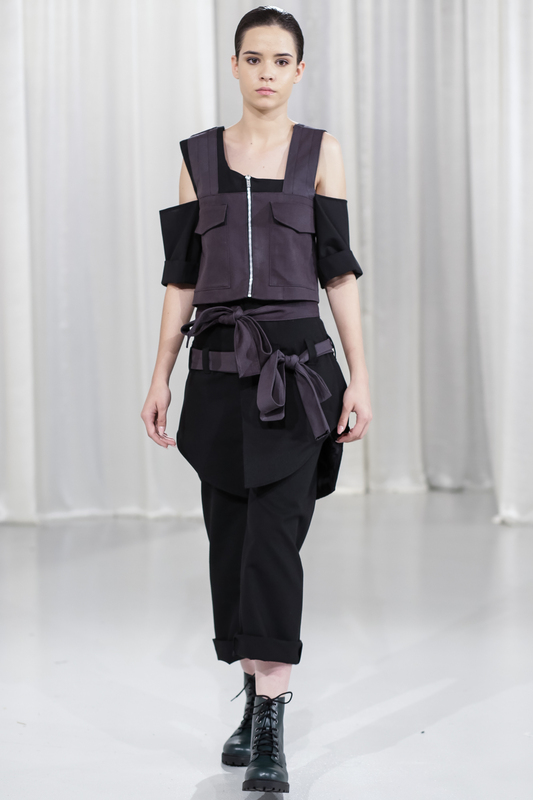 Her introspective approach on the analysis of concepts allowed her to create garments which carry with them the beauty of ideas while being able to stand alone as functional and wearable items of clothing. 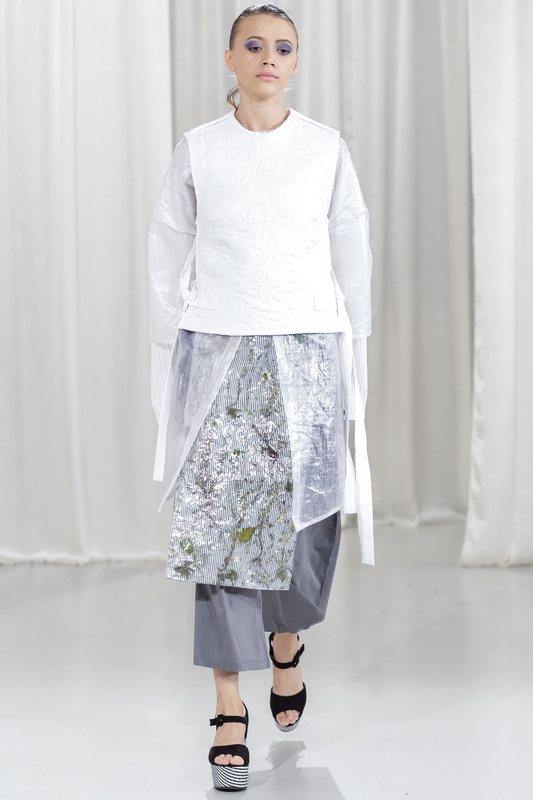 The designer uses natural fabrics which she embellishes with lace to create the illusion of dimension, and metallic buckles to give weight and offer closure. Clothes can sometimes function as intimate symbols of personal transformation, and Andreea Castrase understands that. The items composing her collection have the ability to become timeless pieces, carrying with them the stories of many rites of passage. 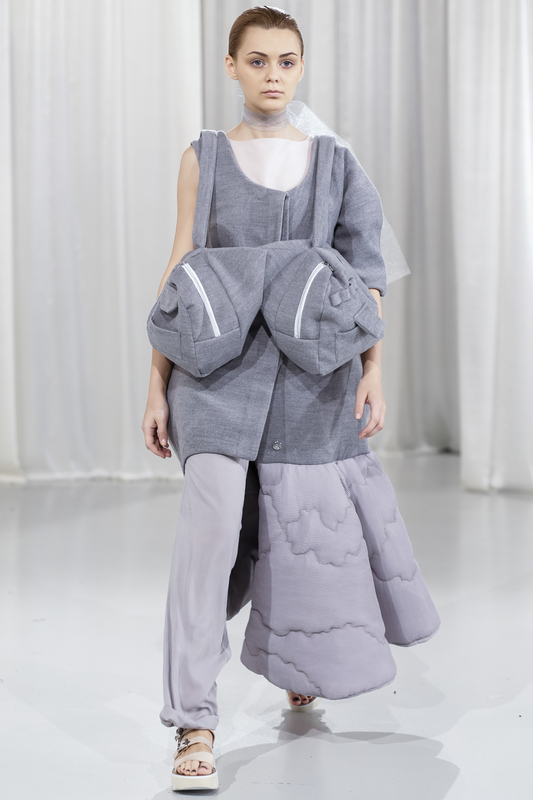 For her creativity, the use of concept and modern sewing and cutting techniques, Andreea Castrase was rewarded with the Syoss Award for innovative design.